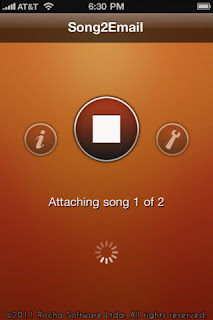 Developer Quote: "Song2Email allows you to send songs from your music library to any email address! Now you can share songs with your friends anywhere you go!" We have started switching the radio station around at work trying to find hot, new songs rather than listen around the clock to the same top 20. After an entire day in the office, songs that were once my favorite have been so overplayed I almost wish I never had to hear them again! Honestly, it could not be easier to use Song2Email. Just tap the large musical note icon in the middle of your screen to choose the songs you want to share, tap Done, and an in-app e-mail appears with your song title shown in the subject line. The body of the e-mail informs the recipient that one or more songs are attached. 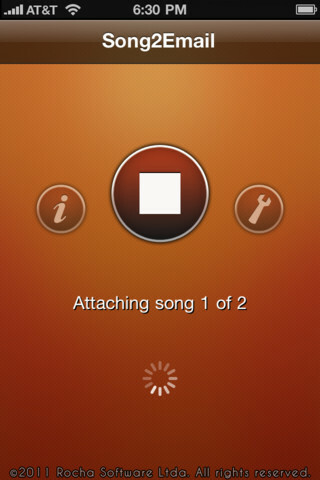 You will see the icon underneath for the song itself with its format shown. 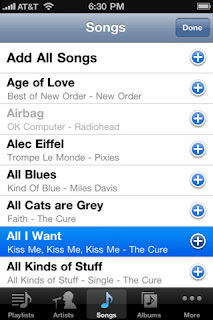 Add in your friend's address, tap Send, and off your song goes to be enjoyed by someone else. It's that easy! You can customize a bit by using 3 toggles in the Settings as to whether or not you want the Artist in Song Name displayed, the e-mail Subject or Body Generated. I kept all 3 items toggled On as it only makes my job easier in sending off my songs. As you might imagine, your music can be sent via 3G. However, WiFi is recommended for sending emails with large songs. Sharing your music has never been this easy or fun! COOL CONCLUSION: "Share songs you love with friends by easily attaching them to email, sending quickly and hassle-free using Song2Email!" --iOS/Age Rating: This app requires iOS 4.1 or later. Rated 4+.